February and March in our part of Spain is unpredictable and often full of surprises. If people come wanting some winter mountaineering, then most years it is possible to fill a week in the snow. On the other hand being southern Spain, we often get clients wanting a week of walking in the sun; this we can usually accommodate but not always, as the weather in the mountains can be fickle. Last week we had such a time and although we had some nice sunny days, we also found ourselves snowed in! Fortunately, at Mountain House Holidays we had the snowshoes ready and were able to walk out from the front door enjoying superb views of the various mountains around us (Contravesia, Sierra de Lujar, Malaga Mountains, etc. ), as well as views down to the Mediterranean Sea some twenty miles away with occasional glimpses of the mountains of north Africa. It was Thursday and we had initially wanted to go to Orgiva market. Waking to 200mm of snow convinced us that even with serious 4 wheel drive this was not going to happen, so it was a case of plan B! Living at 1300m above sea level does sometimes mean that you have to go with whatever the mountain throws at you. In our case, the hill that we live on goes on up to 3011m and is called Cerro del Caballo. It is Europe’s most westerly 3000m peak and the last mountain at the western end of the Sierra Nevada. Neither of our clients had used snow shoes recently but were both more than willing to give it a go! So off we headed, initially following the line of the dirt track road that leads to our house. Once we had got to the main mountain track, we took a series of lines following “fire breaks” up through the forest reaching a height of 1680m. During the course of our 3 hour ascent we saw no one else but crossed the tracks of wild boar and mountain goats. Our descent only took an hour and exhausted we sat by the log fire enjoying a late lunch washed down with well earned cool beers. Finca Montaña is a remote mountain cortio on the southern slopes of the Sierra Nevada above the spa town of Lanjaron. Reached by a 12Km drive up a windy dirt track road, it is the perfect place for those who like to be away from the trappings of modern life. Mike and Jane who own Mountain House Holidays are qualified International Mountain Leaders which is the requisite qualification for leading snow shoe treks and walking in Spain’s Sierra Nevada mountains. When based in Spain, Mike and Jane also operate as Sierra Nevada Guides and take on individual guiding commissions. 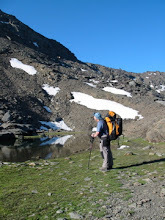 There is a host of information about the Sierra Nevada on the Sierra Nevada Guides website.